In retrospect, I’m sure that an important part of what excited me about John Updike’s second novel, Rabbit, Run, when I read it in high school circa 1960, was the fact that it was recounted in the present tense, thus giving it some of the immediacy of a movie—rather like the thrill of the opening chapter of William Faulkner’s Light in August, which I first encountered around the same time. As Updike himself later noted, the movieness of his present tense was a conscious strategy—he even thought of subtitling the novel A Movie—although ironically, it’s precisely this sense of now and its location in the Eisenhower era that is most conspicuously absent from Jack Smight’s flatfooted 1970 movie adaptation (available on DVD from Warner Brothers’ Archive Collection), which doggedly tries to be “faithful” in its own misguided fashion, even to the point of updating the action from 1959 to the present, but only comes across as conventionally shopworn as a consequence. What’s clearly lost isn’t only Updike’s sense of history, pop-culture references and all, but the vibrant weight of the eponymous hero’s existential decision-making. James Caan may have been perfect casting as Rabbit Angstrom, but the movie offers him only a standardized void to act in. 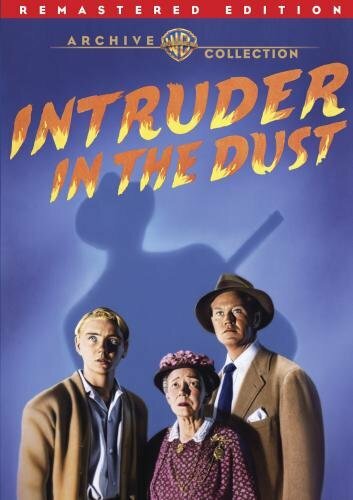 I was spurred into rewatching Clarence Brown and Ben Maddow’s 1949 adaptation of Faulkner’s Intruder in the Dust (available on another Warners Archive Collection DVD, this one remastered) by Mark Rappaport’s latest video America’s Grandpa, which includes a clip from Intruder featuring the video’s subject, Will Geer. In this case, I’m concerned less with the film’s fidelity to the novel (not one of my favourite Faulkners, though it’s probably one of his better late works) than with its fidelity to the Deep South, which is singular, and with its politics, which are unusually advanced for 1949 (and even, in some respects, for 2019). This movie would make a terrific double-bill with Jacques Tourneur’s Stars in My Crown (1950), another highly uncharacteristic MGM release—not only because of the Southern small-town settings and the memorable central roles played by the magnificent Juano Hernandez in each film, but also because the virtues and wisdom of both of these masterpieces are so complementary. Stars, for all its greatness, is not notable for any of its Southern particulars or its actorly pirouettes the way that Intruder is, whereas Intruder is generally less notable for its domestic details (apart from the cabin of Hernandez’s character Lucas Beauchamp) and family interactions than Stars; Stars is more metaphysical, Intruder more social, but both movies explore both the darker and the brighter sides of small-town communities. In Intruder, the way a crowd turns up in carloads, busloads, and wagonloads in a town square with the loud strains of “Runnin’ Wild” and “Tiger Rag” piped in on speakers to watch a lynching anticipates the dark, carnivalesque atmosphere of Billy Wilder’s Ace in the Hole (1951), and it’s even possible that Wilder was influenced by it. But Wilder’s cynicism is miles away from the Faulknerian postulate that only a teenage boy (Claude Jarman Jr.’s Chick Mallison) and an old maid (Elizabeth Patterson’s Miss Habersham, whose name might have been suggested by Great Expectations’ Miss Havisham) can be unblinkered enough to trust in the innocence of a black man. And, to consolidate this movie’s absence of cynicism, in the film’s final scene we hear the same festive music on the speakers to greet an ordinary Saturday afternoon shopping crowd after the lynching is averted. Where Intruder truly excels is in its wealth of seemingly irrelevant yet flavoursome and telling incidental details—multiple responses to the sheriff’s awful-tasting coffee, the way Porter Hall’s rustic, one-armed patriarch fastidiously unbuttons and rebuttons his shirt before extracting or returning his pistol—because it’s more interested in seeing its characters in the round than in passing out indictments or merit badges. Even the teenage semi-hero and his lawyer uncle (David Brian, who took over the part after Joel McCrea turned it down) have their own moments of bigotry and presumption, and the dignified Beauchamp is allowed some arrogance as well. As far as I know, Intruder is the only Faulkner film adaptation that won the author’s public praise: “I’m not much of a moviegoer,” he said in a 1958 interview, “but I did see that one. I thought it was a fine job. That Juano Hernandez is a fine actor—and man, too.” (At a Q&A session at the Museum of Modern Art many years ago, I asked Douglas Sirk if he knew what Faulkner thought of The Tarnished Angels, his 1957 adaptation of Pylon; Sirk replied that he won Faulkner’s thanks and approval during a brief parking-lot encounter.) The film’s authenticity is usually attributed to director-producer Clarence Brown—who moved to Tennessee from Massachusetts at the age of 11 and later lived in Alabama before he went to work for Jacques Tourneur’s dad Maurice in Fort Lee—but Maddow’s terrific screenplay (which incorporates much of Faulkner’s wit and irony) and the location shooting in and around Oxford, Mississippi, including the use of locals as extras, also play significant parts in the film’s distinction. Apart from a few Kazan features and Phil Karlson’s The Phenix City Story (1955), this is one of the very few Hollywood pictures that shows the Deep South persuasively. 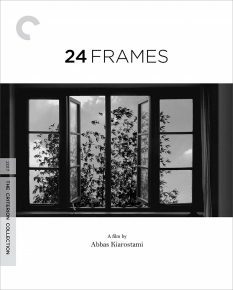 Far and away the most valuable extra on Criterion’s Blu-ray edition of Abbas Kiarostami’s posthumously completed 24 Frames (2017) is a short documentary about its making by the director’s assistant Salma Monshizadeh, which finally gives us some glimpses of other sequences involving paintings that Kiarostami’s son Ahmad decided to exclude from the finished work, as well as a much better notion of Kiarostami’s method of working on this film than we’ve previously had available. By contrast, I’m disappointed that the dialogue between Godfrey Cheshire and Jamsheed Akrami isn’t as insightful or as interesting as their commentaries on Kiarostami usually are. I speculate that hasty editing might have been the cause—presumably the same sort of haste that marred the mainly impeccable Criterion Blu-ray of The Magnificent Ambersons (to which James Naremore and I contributed one of the audio commentaries) with at least one technical glitch, and also by allowing Simon Callow to spout egregiously erroneous and unsupported nonsense about Welles’ behaviour during Ambersons’ post-production that directly contradicts the Blu-ray’s other extras. 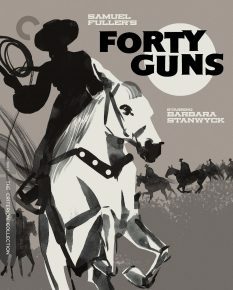 By contrast, Criterion’s Blu-ray of Samuel Fuller’s Forty Guns (1957) is irreproachable. Even if they couldn’t find or include Fuller’s original ending to the film, they’ve had the wonderful idea of letting women dominate the extras (reminding me that when Fuller introduced this film at Locarno in 1993, he said that he was proud of having always been a feminist): not only Fuller’s widow Christa Lang Fuller and daughter Samantha Fuller (whose excellent, feature-length 2013 documentary about her old man is included in its entirety), but also such capable Fuller commentators as Lisa Dombrowski and Imogen Sara Smith. And you’re also able to watch this terrific Western with Fuller speaking at London’s National Film Theatre in 1969 (the time when he was first being discovered and celebrated in the UK) as audio commentary. 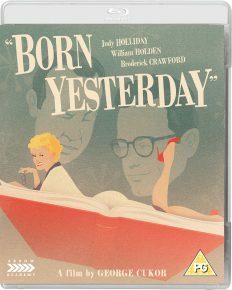 Born Yesterday (1950) has never been one of my favourite George Cukor pictures, at least not compared to Sylvia Scarlett (1935), Adam’s Rib (1949), A Star is Born (1954), or Bhowani Junction (1956); it isn’t even one of my favourite Judy Holliday pictures if placed alongside Adam’s Rib or Bells Are Ringing (1960). But the special features with Geoff Andrew, Richard Dyer, and David Cairns on Arrow Academy’s multi-region Blu-ray all do a swell job of convincing me that this Washington, DC-set comedy is worthy of a second look, especially in the Donald Trump era. Even when these commentaries repeat a few points, which happens often, such overlaps only serve to fortify their overall pertinence; it’s good to hear all three chime in on Cukor’s testimony to Gavin Lambert that Holliday’s performance honoured both the commas and the semi-colons in Garson Kanin’s dialogue. Similarly, the editing of clips with Cairns’ commentary is so purposeful and precise that it matches the economical way that Criterion’s Forty Guns supplement with Christa and Samantha quickly illustrates what Sergio Leone learned from Fuller. 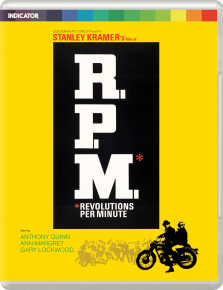 Whatever possessed me, one might ask, to watch Stanley Kramer’s 1970 R.P.M. (Revolutions Per Minute), a movie about campus protest, for the first and only time? Well, for one thing, Powerhouse Films sent me a Region B Blu-ray without my asking for it (which also happened, by the way, with the Arrow Academy Born Yesterday disc), so why not give it a whirl? Scripted by Erich Segal, it stars Anthony Quinn as a radical sociology professor in his mid-50s who, after being named acting president of the university, tries and fails to reach a settlement with the white and black students occupying the administration building and threatening to destroy its computer (which proves to be the last straw), then finally throws in the towel and calls in the police. Ann-Margret plays Quinn’s live-in grad-student girlfriend (who is often in various stages of undress, but at least has some thoughts of her own), and Gary Lockwood is the student rebels’ charismatic leader. The film’s IMDb “Trivia’’ page maintains that Kramer “always referred to this film in interviews as his least favourite and least successful of the films he has directed,” and it surely isn’t one of his best-directed or most entertaining. But as a film about ’60s radicals and the struggle against middle-aged flab, it’s far more honourable, honest, and accurate (and considerably less cartoonish) than Paddy Chayefsky and Sidney Lumet’s ridiculous if entertaining Network (1976), which won four Oscars and oodles of respectful delight for its right-wing jeremiads against Black Power and feminist power-mongering (the latter represented by evil Faye Dunaway), all presided over by the supposedly nobler middle-aged flab and rage of William Holden. I’m not trying to claim that R.P.M. is a good movie, but it bears witness to its period and subject far more responsibly than its reputation suggests. 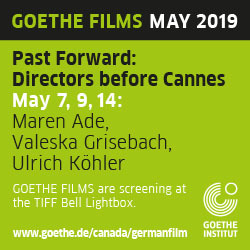 To tell the truth, part of my former objections to both Bergman and Mazursky, like my troubles with Woody Allen, had to do with the various kinds of middle-class and middlebrow complacency that they seemed to elicit or (at times) solicit from some of their bigger enthusiasts. But even after I acknowledge that many of my gripes with Down and Out in Beverly Hills (1986) came from assuming it was a glib softening of Jean Renoir’s sublimely anarchic Boudu sauvé des eaux (1932)—much as Willie & Phil (1980) had turned Truffaut’s Jules et Jim (1962), a rose with thorns, into a veritable creampuff—rather than as some sort of version of the boulevard farce that Renoir’s film was derived from (about which I knew and know little), I now realize that Mazursky’s bohemian and bourgeois instincts tend to run neck and neck. This tendency is evident all the way from I Love You, Alice B. Toklas (1968), which he co-wrote but didn’t direct, to his unfortunate The Pickle (1993)—his second 8½ (1963) knockoff, after Alex in Wonderland (1970)—which he wrote and directed, and perhaps even to Coast to Coast, though bourgeois conventions eventually win out here as triumphantly as they do in Tempest (1982), Down and Out, and Enemies. 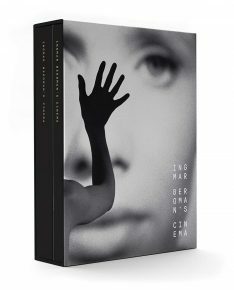 It’s worth reflecting on our unfortunate habit of treating Criterion as a canonizing label like the Library of America—that is, a company that is expected to inform us what the classics are, unlike more modest distributors such as Kino Lorber, that simply put things out. The problem with this default position—an alternative form of Oscar-mongering that is usually supposed to ratify what we already know, and which is far more prevalent than it should be—is that it assumes critical powers and critical authority on the part of Criterion that it doesn’t have, and shouldn’t be expected to have. Arguably, the main reason why they release Henri-Georges Clouzot’s Le corbeau (1943), Quai des Orfèvres (1947), The Wages of Fear (1953), Diabolique (1955), and La vérité (1960), but not the 1957 Les espions (one of my own favourites), is that the first five of these made more money, which doesn’t necessarily make them any better. The truth is that any marketing label, no matter how absurd, becomes useful if it directs some worthy goods in our direction. 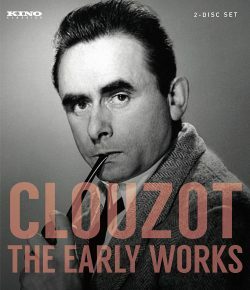 And this ultimately proves to be a blessing, not just because I find I’ll Be Alone After Midnight more enjoyable, more daring, and certainly less pretentious (and thus more canon-worthy) than either Diabolique or La vérité, but also because both we and our sense of Clouzot are granted more breathing space in the process—unlike the pseudocritical extras on Criterion’s Blu-ray edition of La vérité, which pretend to delve into the troubled psyches of Clouzot and Brigitte Bardot but can only come up with the usual celebrity gossip, which it manages to criticize and exploit at the same time, in much the same manner that the media chooses to handle Trump. 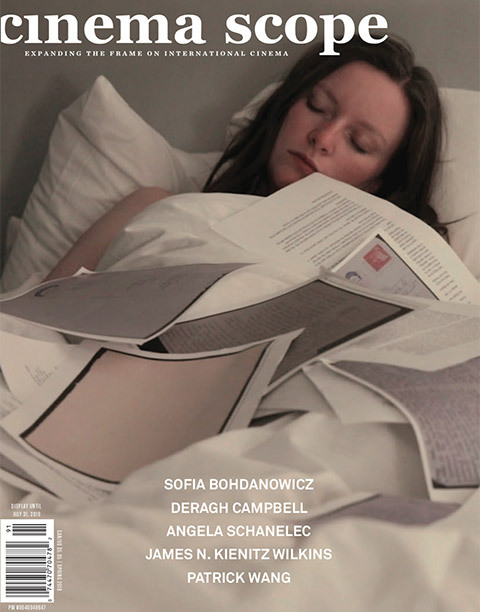 Back in 1992, a film school graduate named Alexander Cassini was sufficiently perturbed by this form of media doublethink—not about political chicanery, but about the validation of serial killers as celebrity-stars in such films as The Silence of the Lambs (1991)—to write, direct, and produce an odd underground 35mm art movie about this phenomenon, Star Time. When it arrived in Chicago the following year as a midnight movie, I covered it sympathetically in the Chicago Reader (the review is searchable on my website, jonathanrosenbaum.net), and now a specialty label that handles grisly cult items, Vinegar Syndrome, has released a restoration in a two-disc, dual-format package, complete with an audio commentary by Cassini, an interview with the film’s cinematographer Fernando Argüelles, and a forgettable Cassini short. 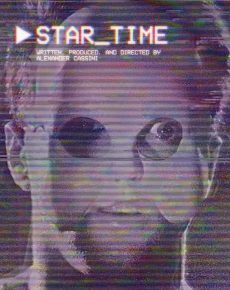 Given that the notion of serial killer as holy figure critiqued by Star Time would be exploited with increasing frequency over the next three decades (in Se7en , No Country for Old Men , and countless others), it would be tempting to call Cassini’s grim parable “ahead of its time,” but that doesn’t quite do it justice—as with Intruder in the Dust, 2019 hasn’t yet caught up with it.